I am always fascinated when I notice the experience of what some would say is the ‘collective consciousnesses; when an individual incident thematically repeats itself. This week it has been the concept of CHANGE. During a workshop I presented on Monday there were several questions about coping with change and I spent a fair amount of time talking about healthy techniques and positive thinking. This week’s theme on TheHarmonyCC’s Facebook page has also been about change in the representation of quotes and comments. 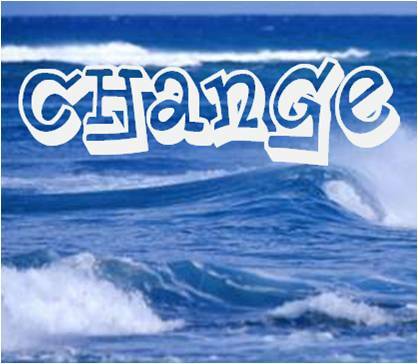 Consequently, my own thoughts have been about change and even my work with clients this week has seemed to focus on their ability to create and accept change in their lives. What is really interesting to me is that I cannot think of an occasion where we (people in general) have had difficulty accepting change when it directly benefits us – a change that we have desired or fostered. Let’s say you are moving because your partner got a promotion that took him/her to a new city. You are leaving your friends / family, leaving a house you may love, leaving your own job, leaving the familiarity of your surroundings, etc. You may not feel good about the move because there isn’t something on the other end that directly benefits or excites you… the CHANGE feels problematic. On the other hand, if it was YOU that got a new job moving you and your family to a different city – the same things apply – leaving everything… but this time – the element on the other end will directly benefit you. Perhaps you are excited about the opportunity this new job brings, the higher salary, the mentoring opportunity, etc…. the CHANGE isn’t problematic for you. Ultimately, it appears that adapting to change is predominately problematic only when there is no direct benefit to our SELF as a result of the change. We can be happy and supportive of the individual(s) who benefit from change and yet have very real feelings of fear or hesitation about our own self in the situation. It’s not selfish to FEEL the fear or hesitation to the change – it’s NORMAL. As I say often – your feelings are neither right nor wrong – they are simply what you feel. Allow them! The more you try to stifle how you feel, the more resentful you will become. This doesn’t mean that you throw temper tantrums, etc. but you DO share your fears, concerns, sadness, etc…. explain to the person you are speaking with that there is nothing they can say or do to “fix” how you feel… you are just taking time to process your emotions. You don’t have to LIKE what is happening but you will have to ADAPT to what is happening in order to have a sense of personal peace. In every situation there is opportunity when one looks (sometimes deeply). This is an optimistic approach but allows the individual something to look forward to. It builds a ‘benefit to self’ into the undesirable change. We all know that change is inevitable. We also know that we are not always the master of change that happens in our lives (death, loss of job, etc.). Yet we also know (hopefully) that we ARE the master of how we respond to change. Embrace and rejoice in positive changes that benefit your ‘self’ and attempt use the techniques / suggestions above to embrace change that feels heavy and unwanted. Think of it as a Rip Current – swim with it and live… swim against it and risk drowning. Next postWhat Do YOU Think?